(Nanowerk News) Reporting in Nature ("Atom-resolved imaging of ordered defect superstructures at individual grain boundaries"), a team of researchers from the UK and Japan, including the London Centre for Nanotechnology, describe how they have been able to unravel the structure of grain boundary defects in ceramics with both atomic resolution and chemical sensitivity by combining advanced electron microscopy techniques with theoretical simulations. Their findings shed new light onto these universally important defects and demonstrate that their structure can be much more complex than is often assumed. Most solid materials, both those formed naturally and those fabricated for technological applications, are polycrystalline. In other words, they consist of a complex arrangement of grains within which atoms form a highly ordered structure. Grain boundaries are the extended defects formed at the interfaces between these grains, and they play a crucial role in determining the mechanical and electrical properties of materials. For this reason, there has been a great deal of scientific research directed towards understanding their atomic structure. A complex and ordered defect superstructure involving calcium and titanium impurities and atomic vacancy defects. The research team constructed a single grain boundary in the ceramic material magnesium oxide by precisely orienting and bonding two crystals together. The resulting bi-crystal was then characterized using a range of advanced electron microscopy techniques complemented by theoretical simulations. The use of high energy electrons to probe the structure of the materials allows for spatial resolution, down to the scale of atoms (of the order ten billionths of a centimeter). 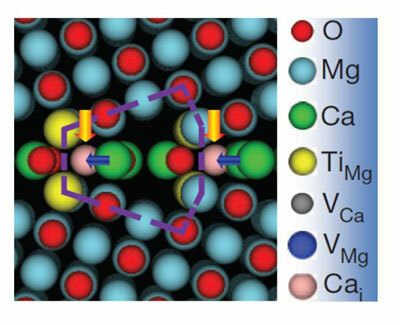 Combined with theoretical modeling, these techniques revealed the chemical identities of all atoms inside the boundary, which form a complex and ordered defect superstructure involving calcium and titanium impurities and atomic vacancy defects (see Figure). These results offer new insights into the complex interactions between defects and grain boundaries in ceramics and demonstrate that atomic-scale analysis of complex multicomponent structures in materials is now becoming possible. Dr Keith McKenna, theorist from Tohoku University and UCL, commented: "After many previous speculations, it is amazing to discover how really complex even 'simple' grain boundaries can be. We believe that the application of advanced electron microscopy to precisely resolve and identify defects inside buried interfaces holds substantial promise for influencing many research fields, where the behaviors of defects or impurities are crucial to understanding a broad range of technologically intriguing properties."